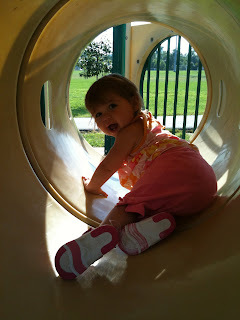 In celebration of our first Fall at home, we are going on a playground tour. We are going to take advantage of the beautiful Fall days and play outdoors at as many different local playgrounds as we can! After several weeks of rain and stormy weather we were happy to take advantage of a beautiful day to start our playground tour at Meadowood Park . Meadowood is a large park with walking trails, playing fields and a playground. As you walk in you cross over a small bridge with a stream over it. The girls love this bridge and enjoy just watching the water. On hot summer days I have even seen kids wading in the stream. There are two play areas right next to each other close to the entrance of the park. One is a slightly larger play set for older kids and the other is a smaller play set for the 2-5 crowd. Both have slides, climbers, tunnels and bridges. The only downside to this playground is that there is no shade, all day. We have gone in the middle of the summer before and it is brutal, however on a day like today the lack of shade is not really a problem. They also have several pavilions right next to the play area for a picnic or even a party.